The satisfying taste of sweet potatoes in this soup is sure to make it a keeper! 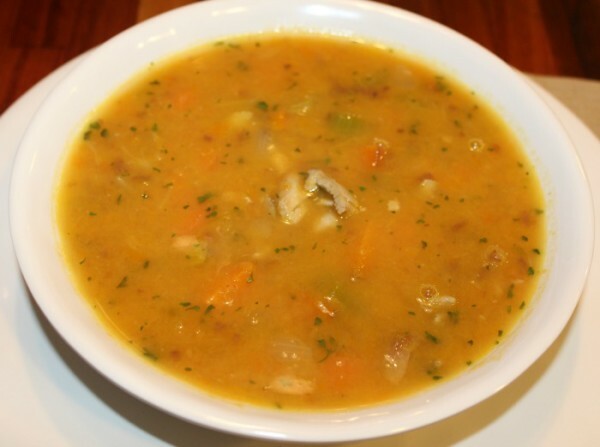 Sweet Potato Chicken Soup has a combination of vegetables that is both tasty and nutritious. My family loves the warming flavor and I love that it’s high in beta-carotene and many other nutrients. In a Dutch oven, saute onions, celery, and carrots in clarified butter over medium heat until onions are transparent. Add chicken broth and sweet potatoes. Cover and simmer until vegetables are tender. Ladle half of the soup mixture into a heat resistant container. Use a stick blender to “blenderize” the soup that is still in the pan until smooth, add the rest of the soup back to the pan and stir. Add chicken and dried parsley, cook until heated through. Salt and pepper to taste, enjoy! The satisfying taste of sweet potatoes in this soup is sure to make it a keeper! Sweet Potato Chicken Soup has a combination of vegetables that is both tasty and nutritious. My family loves the warming flavor and I love that it's high in beta-carotene and many other nutrients. Ladle half of the soup mixture into a heat resistant container. Use a stick blender to "blenderize" the soup that is still in the pan until smooth, add the rest of the soup back to the pan and stir.